Punjab state lottery Punjab state diwali bumper lottery online buy now here. Punjab state Diwali bumper is the most selling lottery of the bumper lottery scheme in Punjab. This time you can also participate in the Punjab state lottery the Diwali bumper lottery scheme. Do not get worried every customer who is the citizen of India can buy online Punjab bumper lottery from any state. You can place the order for Diwali bumper lottery online here. Gandhibrotherslottery is the authorized Punjab state lottery retailer/dealer. We will send the Punjab lottery at your given address. Now PAYTM users can also buy Punjab state bumper lottery easily our registered number is 9815969889 Manmeet Singh and after payment please send your postal address and payment screen on the same number on the Whatsapp. Ticket price is Rs 200+90 Rs extra for postal and packing charges. If you want to know more about bumper lottery you can make the call on 9815969889 Manmeet Singh. Punjab state Diwali bumper this time comes with a new scheme. You can buy online Punjab state lottery online this Diwali bumper 1st, 2nd and 3rd prize is guaranteed to the public. Bumper lottery draw date 14-11-2018 and the MRP of the ticket is Rs 200/- + postal and packing charges 90= 290 for 1 ticket. Postal charge and packing charges will add on the total amount. For example, if you are buying 5 tickets then 1000+90 =1090 is your total amount. Punjab State Diwali bumper lottery first prize (2) of Rs 1.5 crores Guaranteed in sold tickets. Second prize 5 of 10 lakhs rupees Guaranteed in sold tickets and third prize 20 of Rs 2.50 lakh Guaranteed in sold tickets. Lottery scheme is with a series of A/B with a series there is a lot of chance to win the prize. It is the biggest lottery scheme of a lottery in Punjab. To Buy Punjab state lottery or for inquiry call to Manmeet Singh. Punjab state lottery retailer mobile- 9815969889 we deal in Punjab state lotteries. First of all, the Punjab State Bumper Lottery Scheme and second Sikkim State Lottery Scheme and third Goa state Lottery scheme. 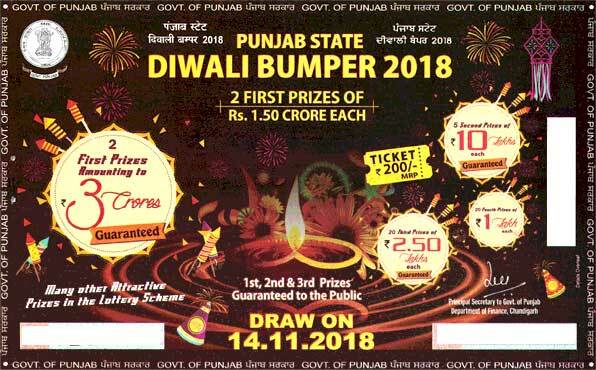 Punjab Govt issues four major Scheme Under Bumper Lottery which includes Punjab State Lohri Bumper, Punjab State Diwali Bumper lottery, Punjab State Baisakhi Bumper, Sikkim State Derby Lottery. The Prize In Punjab Bumper Lottery is Guaranteed in Public with lots of prizes. For more detail, about Online Punjab state lottery, you can like our Facebook page. The result of Punjab State lottery Diwali bumper will declare on 14/11/2018. You can check online Diwali bumper Lottery result and drop an email us at gandhibrothers1984@gmail.com.